Notes: Butler Homerton Hill N. Vol. 2. Map 43.15 (diagram Vol. 5. p.177). 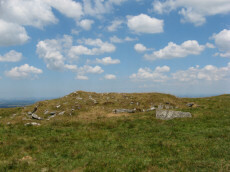 "A small, disturbed cairn containing three edge set stones of a cist ... 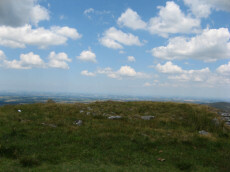 The turf covered cairn measures 3.5 x 3.1m and 0.3m max. height. The top and north side of the mound has been disturbed exposing the three in situ cist stones. 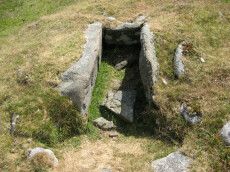 The cist measures 0.8 x 0.6m and 0.3mdeep. It is now open to the north. 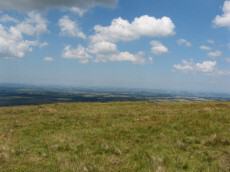 A large stone lying flush with the ground lies immediately north east of the cairn and probably represents the missing endstone or the coverstone". Lethbridge diagram p.156 and photos p157. 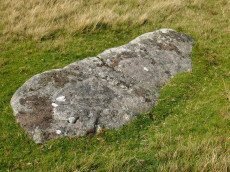 Notes: Possible recumbent longstone on summit of Longstone Hill, east of Meldon Reservoir. 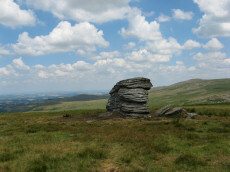 Suggested as possible menhir by Butler and Newman.